It is officially Memorial Day Weekend. I'm excited because I get to see some relatives that I haven't seen in a while. It's times like this that I enjoy life and thank God for. My family is my family even though they've done a lot of mess. I can put that aside and let it go. That's life. 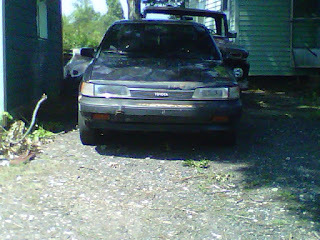 REMINDER : The pictures above are of my car the late Toyota Camry, better known as Michele. The money raised will be used to help me buy a new car. My goal is to raise at least $800 to either go towards a down payment or to buy a car from a previous owner. I'm not even going to try to be picky. Any little bit will help. Thanks and check out the chipin link to help." Chipin under the picture of Michele below. Good night ya'll, Rest Well. What can I see about Qaadir? He is real and will make you laugh and gives the girls life at the same time. However, Qaadir is more than just a youtube perosnality, he is a talented singer, musician. Recently, Qaadir did an adaptation to Erykah Badu's "Other Side of the Game." He entitles it "Man Friend." The song is so smooth and mellow. Qaadir show cases his vocals and really gives us a neo-soul feel. This song shows that love is strong. It will make you do all that you need to do too keep that man friend forever. However, what do you do when you love a friend more than words can say? Get into "Man Friend" below. Well it's graduation season again. Especially for high school students. Today marks a bittersweet day for me. This season is bittersweet because Both of my nieces will emerge as high school graduates on this day. I am very proud of them. My thoughts go back to my high school and my college graduations. As I write this blog, I am trying not to tear up. My mind goes back to when the girls were born and how they grew up before my very eyes. Wow eighteen years go by fast. I'm thinking to myself, "Dang, I'm old." My oldest has had her challenges. She witnessed the divorce of her parents as well as the loss of some of her closest relatives. My oldest niece had to have some things done concerning a breathing and snoring issue. My baby is a trooper. My oldest nieces has danced and grew up before my very eyes. I remember hearing her sing and watching her in her dance recitals. My baby has made me proud. Hasan Greenis one anointed singer, preacher, teacher, and one great man of integrity. His voice has truly been God given and Hasan will touch even the hardest of hearts. In a recent he sings a hit song "Someone To Care." This songs lets us know that God truly cares. God is that someone who cares. Check it out below. The Hodge Twins are among the funniest set of youtubers I've ever discovered. They have admitted to having a weird sick sense of humor, but who cares. These bodybuilding siblings not only teach us how to get buff and stay healthy, but they help is stay healthy with a great medicine better known as Laughter. Get into their sick sense of humor below. Warning your sides will split from laughter. It seems like only yesterday Whitney Elizabeth Houston took a journey to that Heavenly home. She is sorely missed, however she left a legacy and a voice that is timeless. Whitney Houston is one of a kind and there will never be anyone like her. Recently, music from her upcoming film starring Jordin Sparks "Sparkle," has been released. I am overjoyed because Whitney Houston is recorded singing one of my favorite hymns "His Eye is on the Sparrow." This song has so much meaning and I know that it meant a lot to Whitney. Whitney knew that God was watching her and He had her in the palm of his hand. I look forward to the August release of "Sparkle." As you know "Sparkle," is a remake of the 1976 film of the same name. It starred Philip Michael Thomas, Irene Cara, and Mary Alice. Look out for "Sparkle" on August 17th, 2012. Get into Whitney Houston singing "His Eye is on the Sparrow." I live for The CW's latest series "The L.A. Complex." It is truly groundbreaking. It stars Jewel Staite, Andra Fuller, Benjamin Charles Watson, and Chelan Simmons to name some of the cast. The show is about young hopefuls trying to make it to stardom in the Music and film industries. Each relationship, trial, and decision is chronicled. What is interesting about this show is that it is on prime time and it shows a gay relationship with King (Andra Fuller) and Tariq (Benjamin Charles Watson). Kaldrick King is a down low rapper and Tariq is a producer and musician who writes beats and inspires King within the music spectrum however there is a sensual chemistry that will push you to the edge of your seat. However it is troublesome that it deals with the stereotypical Down Low brother syndrome adding even more negative stigma to the stereotype. Love will let a person learn the hard way, then embrace them after the fall. Have a great day ya'll. Go ahead and get that cup of coffee and start your day of right!!! Nothing surprises me anymore. It really doesn't. Here lately, things that should've caught me off guard didn't. For some odd reason I was totally prepared. Just like a recent break up. I was prepared, but I still was kind of disappointed. However, that's life. I've decided to sit back and observe people. I haven't really had much to say. My reason being is that sometimes silence really reveals the truth. So in my sitting back and being quiet, I have seen some true characters be revealed. The sad thing is that I've seen it with family and friends. Before I go to bed I want to give thanks for another day. Before I go to bed, I want to just leave my thoughts with you. Before I go to bed, I cast all my cares and burdens on you, so that tomorrow I can rise along with that brand new mercies that you've given me. I lay down my heavy burdens so that in case I don't see morning light, I'll be able to fly with those morning doves and amongst the angels. Before I go to bed, I come to you to find refuge for my soul. Thanks for your forgiveness. Now I can rest in peace.